Yukitakeya is a souvenir shop in Matsushima in Japan's northern Tohoku region. This shop has exclusively handmade souvenirs and signature rice crackers. We will introduce these delicious rice crackers what keepsakes and gifts to look for. Matsushima is a famous travel destination located a 30-minute train ride away from Sendai Station in the Tohoku region. It is known for its stunning views of the islands of the Matsushima Bay and pine trees scattered across the landscape. Matsushima Bay is regarded as one of the Three Views Of Japan, along with Miyajima, Hiroshima Prefecture's Itsukushima Shrine and Amanohashidate in Kyoto. There are also tourist attractions such as the Zuiganji Temple, a Zen temple that is one of Japan's national treasures, and the Fukuura Bridge, a vivid vermillion bridge. Travelers will also find treats and goods that make excellent souvenirs and gifts. Matsushima is a location you will fall in love with and want to visit again. 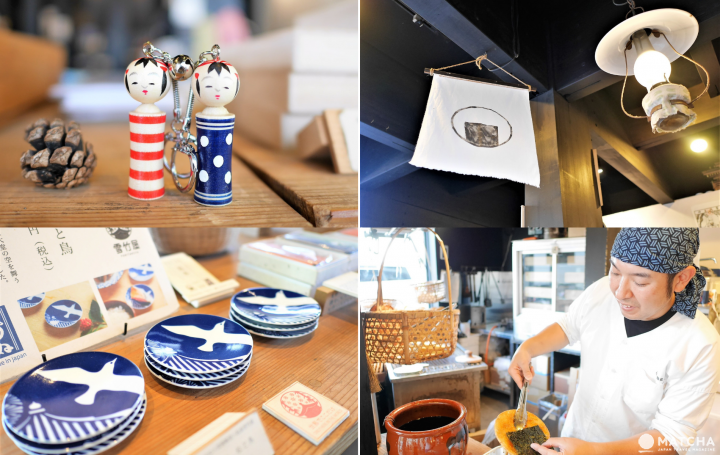 In this article, we will be introducing Yukitakeya, a souvenir shop that specializes in products of the Japanese culture, exclusive to Matsushima. Yukitakeya is a 7-minute walk from JR Matsushima-Kaigan Station, down the road facing Matsushima Bay. Their specialties are rice crackers and souvenirs from Miyagi Prefecture and the Tohoku region. According to shop manager, Goto, "Yukitakeya focuses on items that carry the culture of Japan. We also sell handmade products." Products are specifically selected by the shop manager. Goto also added that the shop places importance on offering products exclusive to Yukitakeya. Let's take a look at what kind of products they have to offer! Yukitakeya carries a wide range of products, including condiments and miscellaneous items. However, they are dedicated to making their signature senbei, which are Japanese snacks made of rice. These rice crackers are roasted daily over the counter and are also available packaged to take home. We had the chance to try these expertly-roasted rice crackers during our visit. They were grilled evenly on both sides for five to eight minutes to prevent them from burning. It is a lot of fun to watch the flat surface of the rice crackers bubble and puff as they slowly brown. After roasting, the rice crackers are dipped into soy sauce and are immediately taken out to get rid of excess liquid. Too much soy sauce would ruin the texture of the rice crackers. Next, they are wrapped with a piece of seaweed and served in a paper pocket. As you take a bite of the warm rice cracker, the exquisite aroma of the soy sauce will fill your senses as you bite into the crunchy texture. Customers can take a rest and enjoy their rice crackers with roasted green tea at the rest area inside the shop. Displayed in middle of the shop are packaged rice crackers, allowing customers to continue to enjoy them even after their trip ends. Some rice crackers can be sampled. The most popular are the cracked soy sauce crackers. These rice crackers are freshly roasted and then split into four before being dipping into soy sauce. They are cracked into just the right size intentionally, by hand. The cracked edges allow the soy sauce to seep through, creating a rich flavor. At a certain time of the day during weekdays, customers are able to witness these rice crackers being made over the counter. The entire process of splitting, dipping and packaging the rice crackers takes about three days. The cracked brown sugar crackers (top-left picture) are customer favorites during summer and autumn. These cracked soy sauce crackers covered in large granules of brown sugar. The distinct soy sauce flavor brings out a delicious, sweet taste. The nurekari crackers (top-right picture) are also another hit item. These rice crackers are soaked with sweet soy sauce and are roasted twice to make them crunchy. Other tasty and adorably-shaped rice crackers are also available for purchase. There are rice crackers of the shape of the Zuiganji Temple (bottom-left picture) that can be seen from the shop. There are also heart-shaped rice crackers (bottom-right picture) with "Thank You" written on the packaging. With so many great options to choose from, it might take some time to decide which one to pick! Original Japanese Products Only At Yukitakeya! This "ONLY HERE IN THE WORLD" mark designates products that are sold exclusively at Yukitakeya. In this section of the article, we will be introducing this original merchandise. The Pine And Bird plate (972 yen including tax) is small dish that comes in the design of the Zuiganji Temple. Pine trees and a seagull fly across the sky. In Japan, restaurants and shops have a custom of placing salt by the entrance of their business to ward off bad luck. These plates are the ideal size for this, but you can use them for snacks and side dishes, too. The Matsushima Oko (1,404 yen including tax) is a specially-made oko (*1) of the fragrance of Matsushima. It has a calming forest scent. It comes in a Paulownia box with the motifs of Zuiganji Temple, pine trees, and a full moon on it. Matsushima is a famous place for moon viewing. This is reflected in the haiku (*2) of Matsuo Basho, the renowned Japanese poet from the Edo period. *1: Oko: Fragrant wood incense that releases aromatic smoke when burned. *2: Haiku: A short form of Japanese poetry based on the rhythm of sound. The kokeshi chopstick holder (907 yen including tax) is used to rest the tips of your chopsticks on. The faces of the kokeshi (*3) are hand drawn, resulting in subtle differences in their expressions. It functions as a chopstick holder and also makes an adorable accent for your home. *3: Kokeshi: Japanese dolls carved out of wood. They are traditional crafts of the Tohoku region. You can find many tenugui at Yukitakeya. The eight different tenugui pictured above are exclusive to Yukitakeya. They come in designs of the full moon, kokeshi, and in other Tohoku region patterns. They are not bulky and make ideal souvenirs. Tenugui towels were a daily necessity during the Edo period and Meiji period. These towels can be used to wipe your hands and body, wrap water bottles, and used as decorations. They are absorbent and are quick drying. They are an excellent to bring with you for travel. Occupying the second-story of the building is Shokado Confectionery, an affiliated confectionery and cafe. Over here, customers can enjoy homemade desserts with a view. It is a wonderful place to appreciate Matsushima's spectacular scenery while taking a break from gift shopping at Yukitakeya. We highly recommend Yukitakeya if you are looking for one-of-a kind souvenirs to buy in Japan. The shop offers unique and nostalgic Japanese snacks and fun goods. Each handmade, high-quality item is made with care. Visit Yukitakeya to experience this special environment for yourself! Noren Kagurazaka - Cute Japanese Items You'll Want To Take Home!